I'm going to end our visit to Kagoshima with some bridges across the Kotsuki River. We are in the area where the Edo era stone arch bridges were damaged by flooding. It's hard to imagine that this river (with about six inches of water) could overtop its banks and destroy all of those heavy stone bridges. Japan's bridges are highly decorated and the bridges across the Kotsukigawa are some of the most decorated bridges I've ever seen. 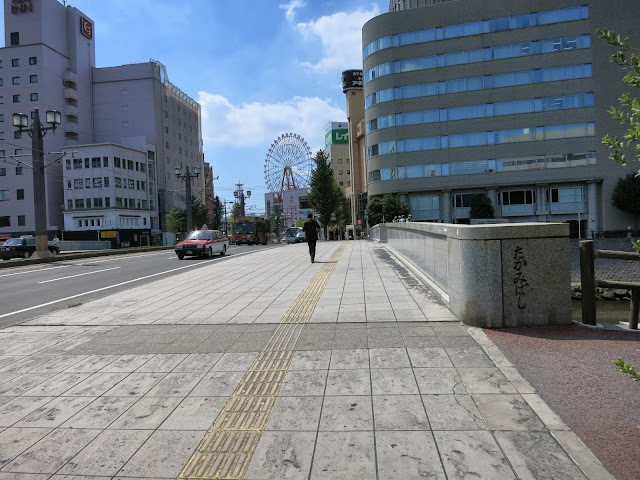 Today's bridge carries the Tenmonkan Densha Dori (Road) and a trolley line over the Kotsukigawa. There are a half dozen sculptures on or adjacent to this bridge. At a bastion over the pierwall is a sculture decorated with children playing. Looking west on the bridge deck we can see the power cables for the trolley line and the ferris wheel on top of Amu Plaza (shopping mall) next to the Kagoshima Train Station. Near the southwest end of the bridge is a sculpture of a woman wearing a kimono. There are sculptures of lions and of elder statesmen on pedestals adjacent to the bridge. The barrier rails are made of marble and there are metal plaques in Kanji explaining it all. Kagoshima Prefecture, Japan's Bridges: Tenmonkan Densha Dori Bridge across the Kotsuki River by Mark Yashinsky is licensed under a Creative Commons Attribution-NonCommercial-NoDerivs 3.0 Unported License.